Friday's BLS report on employment will make a big adjustment to their "birth/death" model, that will strip fake numbers out of the workforce. It's backward-looking, to affect April 2008 through March 2009. 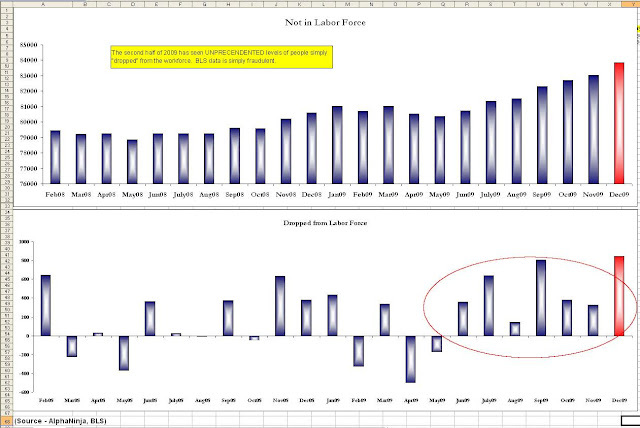 Rather than this being an example of a worsening employment picture, it's simply a confirmation that things are worse than the Bureau of Labor Statistics has been reporting - no shock to readers of this site. Well, today they're confirming it. 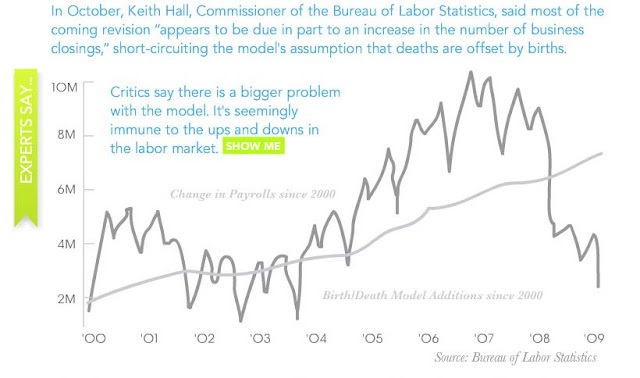 Bloomberg is reporting that this Friday's Bureau of Labor Statistics report will be adjusted to take out the completely false numbers that were the "birth/death" model. You can read about the model here, but in general it is an accounting trick that adds numbers back to the employment situation, due to the (wildly inaccurate) assumption that each closed business is replaced with a new business. As Bloomberg shows in a TERRIFIC interactive image, skeptics of the birth/death model were correct, in that it was inflating employment.